Whether you play it for the love of the game, to get fit, to socialise with friends – or maybe a mix of all three – 5-a-side is arguably the best form of exercise that you can do. It provides an intense workout that few other sports can match, results in loads of social and mental benefits, and most of all it’s fun. That’s why it has become the people’s game here in the UK, becoming even more popular than the full 11-a-side game. 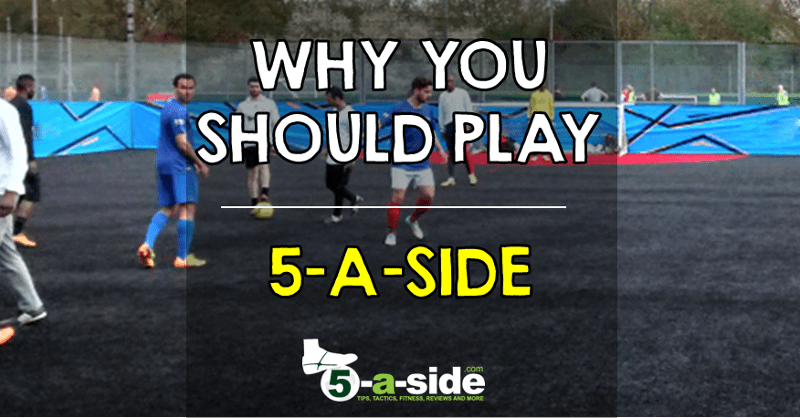 A lot of work has recently been done to prove the health benefits of 5-a-side, and it has been shown that regardless of your age, gender or playing standard, it’s very hard to find a better overall form of exercise than 5-a-side. The data out there is overwhelming, but we’ve condensed it down into this handy infographic to tell you everything you need to know about the greatest game on earth. (Click on the image to view a larger version on mobile devices). Please feel free to share this image on your website and on social media, though if you’re putting it on your site we’d appreciate a link back to this page. If you’re new to 5-a-side.com and want to know more about the game – why not start with our collection of best articles. Excellent article. Really great way of laying it all out – it’s really hard to argue with it! I love 5-a-side anyway, and even more now I’ve seen this. Keep up the good work. I love 5-a-side anyway (for the reasons in the top section of the graphic) but it’s great to know that I’m not sweating each week for nothing. That’s a phenomenal list of benefits. I thought you’d enjoy that list. It blew me away when putting it together!